How Do Birds Stay Warm in Winter? It’s cold outside. Much of North America is in the midst of a deep freeze with the kind of cold that makes you wish you could hide under a large pile of warm blankets. But what do birds do when it gets this cold? Pull out a small pile of warm blankets to hide under? Well, actually, that’s pretty close to what they do, but it’s not blankets they hide under; it’s their own feathers. The reason why blankets keep you warm is they trap a layer of air around your body, which is then warmed by your own body heat. This warm air acts as insulation from the cold air outside the blanket. Birds feathers can accomplish this same feat. During warm weather, the feathers on a bird’s body are pulled tight to their skin, which is what gives birds that sleek, aerodynamic look. But this also lets most of the heat generated by the bird escape from its skin, keeping its body cool in summer. In winter, a bird will still have to maintain a sleek, aerodynamic profile when it is flying. But on cold days, watch carefully to see what small birds do when they land on a perch. Once they are settled on the perch, they suddenly balloon in size, looking more like a small, fluffy beach ball than a bird. What the bird has done is expanded its feathers, creating pockets of air between the small contour feathers which are closest to its skin. In a very short time, the bird’s own body heat has warmed those air pockets and in effect, created a warm blanket around its body. As long as the bird is able to remain at rest, it will be quite comfortable, even in times of extreme cold. By creating this small blanket of warm air, birds not only remain warm during the day, but they will also be able to survive the long cold nights of mid-winter. 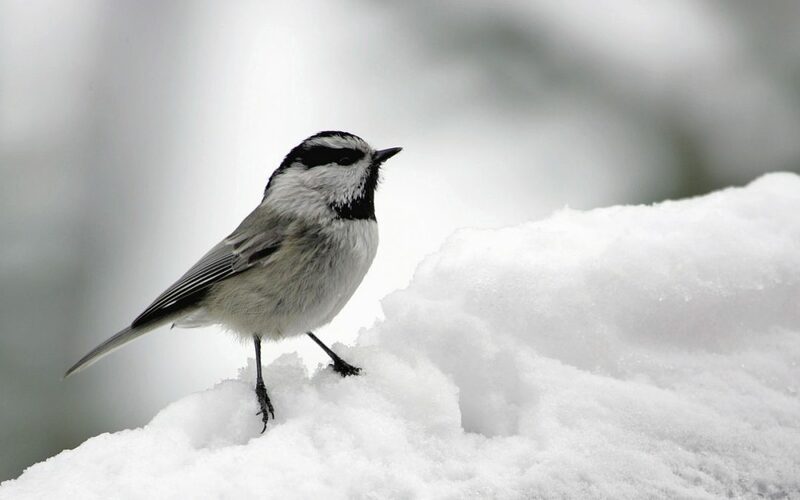 Maybe that’s why Chickadees always seem so cheerful, even on the coldest days – they know they’re warmer than you are.